court reporting Eugene Oregon | Todd Olivas & Associates v3.0 | Court Reporting Services in Orange County, Riverside, San Bernardino, San Diego, Los Angeles, Irvine, Santa Ana, San Jose, Sacramento, Fresno, San Francisco, Bakersfield. TO&A employs no court reporters, interpreters or videographers of our own. The providers we send are fully qualified and reliable independent contractors. Welcome to Eugene! We're proud to have access to one of the best deposition-taking environments anywhere in town. If you're looking for a deposition suite that facilitates a quality court reporting, interpreting and videography service -- look no further! The TO&A Eugene Court Reporting Suites is situated within the Lane Community College, centrally located in Western Oregon, just an hour’s drive away from the rugged Pacific coast to the west and the snow-capped Cascade Mountains to the east. Surrounded by Eugene’s forested south hills, the Lane Conference Suites provides an extraordinary range of versatile room types including meeting/deposition rooms which can accommodate 25. 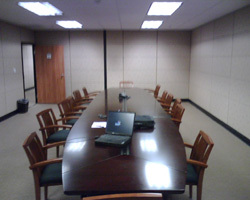 The rooms are fully furnished and have an extensive list of audio/visual service and equipment including ceiling-mounted LCD projectors with simultaneous projection technology, videoconferencing capability, and wireless high speed internet access. Our friendly, professional support staff is available for your court reporting needs on an as-needed basis. Situated among the restful forested hills a few minutes south of Eugene, and just a few minutes off Interstate 5 – along Oregon’s main North/South travel corridor, the area offers beautiful scenery and many recreational opportunities. Within a few driving hours are the city of Portland, the Shakespearean Festival in Ashland, and the world-renowned Crater Lake. To schedule a Eugene Court Reporter, please schedule online or call (888) 566-0253. We'll provide you with a freelance court reporter, interpreter, and videographer in Eugene, Oregon. The court reporters we send are state licensed (where applicable), and always prompt and courteous. Our goal is your complete satisfaction which is why we only work with the best court reporters available. Our interpreters are all certified, all languages -- and be sure to tell us which dialect you need if it's an exotic language.